I think everyone knows by now that I feel so lucky to be part of the team at Canadian Scrapbooker magazine. 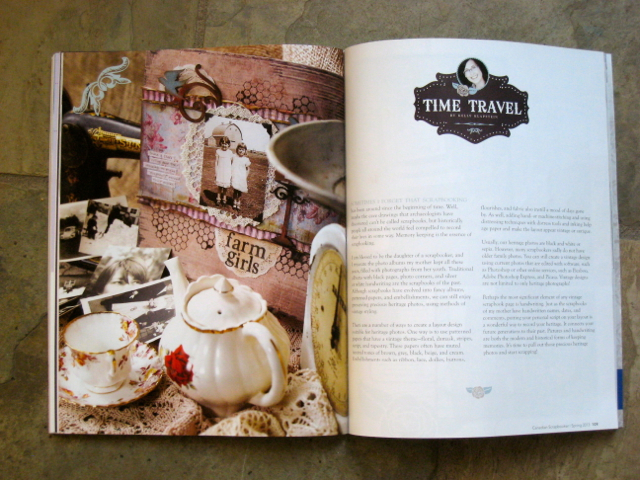 Writing and designing for this wonderful publication is a dream come true! 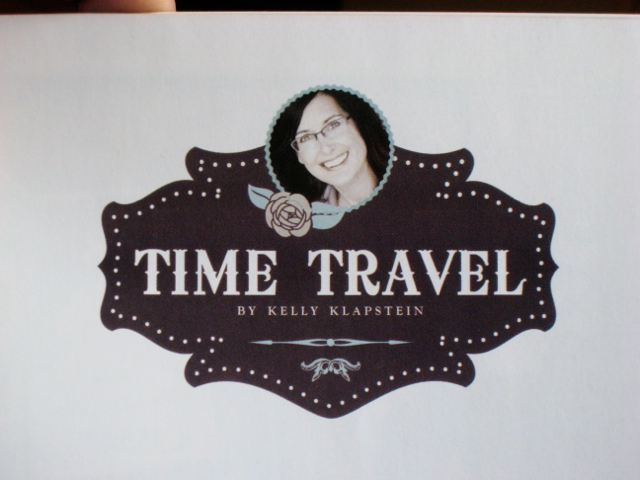 When the Spring 2013 issue was released this past week, I was surprised and thrilled to see my little head on the cover, along with my name and article title “Time Travel.” wow. This blew me away! A big shout out to Christy Dean who took this head shot. She is so talented! 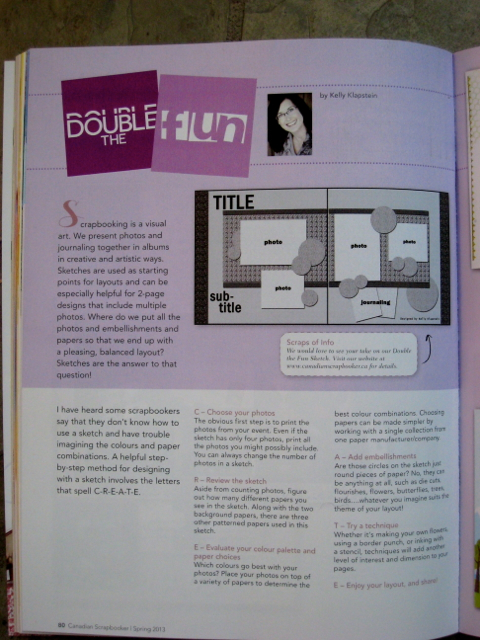 Here is my new Double the Fun sketch for the Fall 2013 issue…. 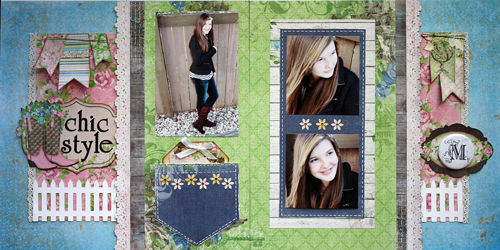 And my layout sample (you can see both on the Canadian Scrapbooker website Home page). Featuring BabyOfTheFamily and Bo Bunny’s new “Prairie Chic” collection. 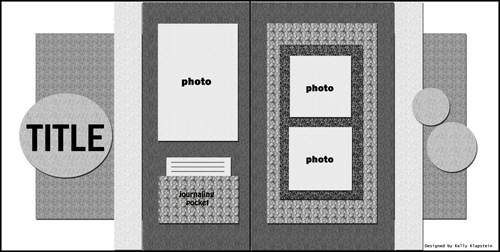 I’d love for you to use my sketch and submit your layouts! Click HERE to see the submissions page online at the magazine. 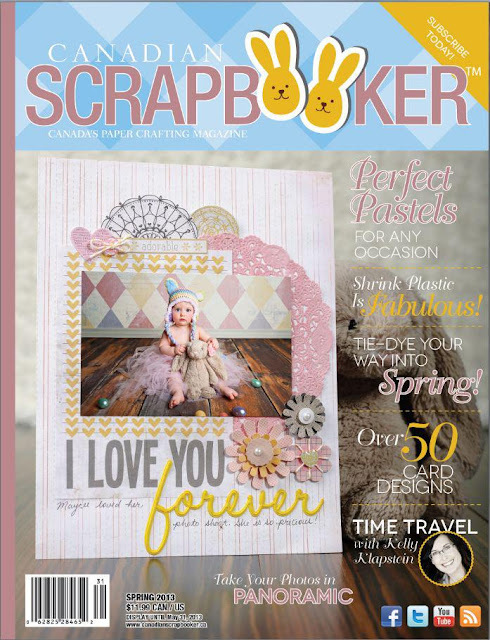 As well, today on the Canadian Scrapbooker blog, it’s Tuesday with the Team, and my studio tour is posted there. 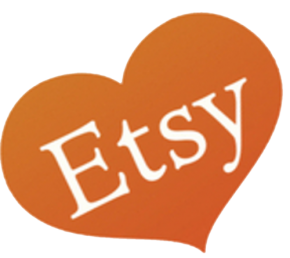 My final announcement is the WINNER of the Crop Circles blog hop……drum roll……. 19 Comments on Awesome Announcements! Big congrats on all your awesome news! You’re a Supah stah my friend a supah stah! Just joshin! You know I’m super proud of you and all your accomplishments Kelly! I was thrilled to se you on the cover so I can just immagine how thrilled YOU were!BIG HUGS! Wow, that is awesome Kelly!! Congrats to you!! Love your double layout, I must try one, they intimidate the heck outta me 🙂 Congrats to Natasha for winning your blog candy! Can’t wait to hear what the other exciting news is! Congrats on making the cover, and your studio is adorable! I love all the elements you’ve got in there that were inherited- your dads’ stapler, your moms sewing pin cushion, and the things your kids have made for you. I LOVE your dresser…I think I may do the girls’ dresser over in a teal kind of color. Or my own! Haha. Thanks for the inspiration! oh you must have been so thrilled, that is awesome!!!!!!!! 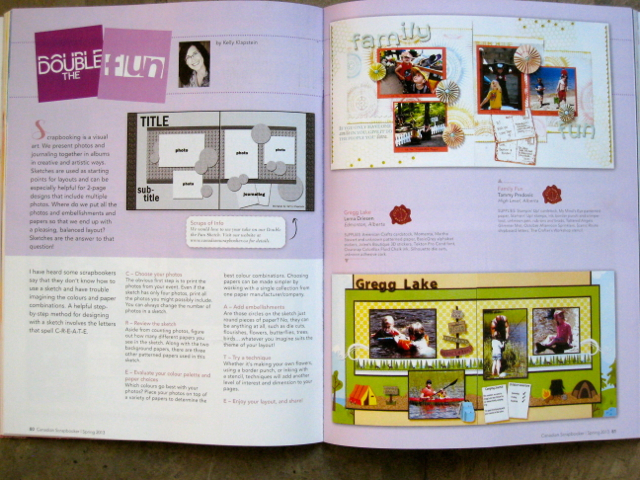 I love seeing your articles and layouts in the Magazine. Your amazingly talented my friend. Love your layout for double the fun. I will try to play along. Now… I’m anxious to hear the news!!!! Congrats on all your well-deserved success. You have worked hard and deserve recognition for your talent. I love your little head and Farm Girls. 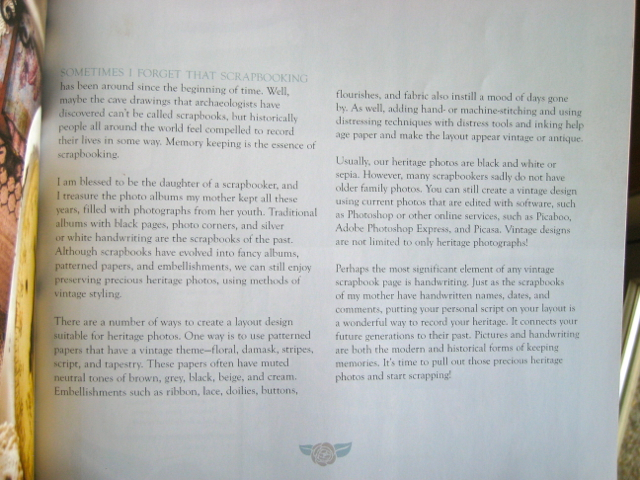 Also the double page with your daughter! You are a great writer and designer! A cover girl!! Congratulations. Well deserved. You do such beautiful work. They are lucky to have you, Kelly. I am so happy for you. Nice work! I have the magazine but haven’t read it yet; I can’t wait to see what you have to share! And to YOU, Kelly, my sweet friend! No one deserves being a cover girl more!!! You are not only talented, but always so kind and encouraging to everyone around you! You are going places, girl, and this magazine is lucky to have you on their team! And me to call you my friend!!!! !